The video is slow moving and long, but sincere. All of those featured as presenters are gone, as are Tony and Betty Maffei. Please be patient and forgiving as I make my opening remarks. My hope is that this video will serve as it was intended to serve, a time capsule awakening us to a new future for the arts. At the time, we were making the decision to close the Eureka Springs Guild of Artists and Craftspeople so that we could shift attention to founding the Eureka Springs School of the Arts, now in its 21st. year. 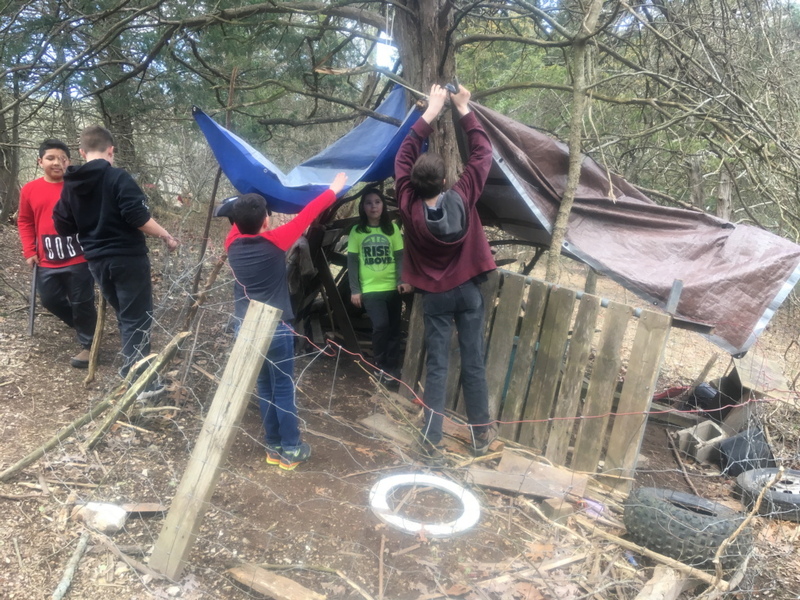 When the students at the Clear Spring School finish lunch, many of them go into the woods to build forts. The photo shows one. There is a rule. If someone wants to join your group, he or she must be welcomed in. Human culture must arise new within each generation. Make, fix and create. Have faith in the assumption that others will also learn best likewise. My first through 4th grade students made objects of their own design. I told them it was "free day", their favorite thing, but with this caveat. I required that they use rulers and squares to make straight cuts, and found objects to make circles. I want their lines to be deliberate, and less random than has been the case. My fifth and sixth grade students worked on the bridge connecting the play field with the new hands-on learning center that will come into use during the next school year. My wood shop will be moved to the new location, and the bridge should have hand rails and be ready for use next week. My 7th through 8th grade students spent their hour in wood shop turning on the lathe, but also attempting to video the process. There are a few good things that happen when we attempt to explain and share what we do with others. We address what we are doing with greater care. We think about things from different angles. We engage the editorial functions of mind. The student's job must be to do, but not mindlessly as is sometimes the case. The teacher's job is to require the student to reflect. If you want to get good at something, do a lot of it and then teach what you've learned to someone else. On another front, I've arranged for a video to readied for sharing on youtube that's about the early days of the arts in Eureka. I regard history as being important, and that to understand why we are all here, and where we are going next demands that we know more about the starting point and the folks involved. The video, titled "Legacy in the Arts" features Louis and Elsie Freund and other leaders from the early arts community of Eureka Springs. I'll also plan a public showing in collaboration with the Eureka Springs School of the Arts. Make, fix and create. Sustain an environment in which others may learn lifewise. Since 2001 I've been in pursuit of a publisher for a book, "The Wisdom of the Hands, a craftsman's guide to educational renewal" I have had endless talks with agents and publishers. Let me correct that. The talks had always been ended one after another by rejection. And yet, the hands carry on as the primary source of human wisdom and intelligence. Anaxagoras had said, that "man is the wisest of all animals because he has hands." So there's actually nothing actually new here, but because education has become so estranged, we need a clarion call. And that's what I've had in mind. Yesterday I had a great conversation with a friend who has just finished a novel, based on his experience as a helicopter pilot in Viet Nam. Now that the book is done, my friend was curious about the publication process. The choice is this: Write a book that fits a prescribed model, find an agent who takes 20% with a publisher who takes 80% and the author gets what's left. The alternative is to self-publish and get 80%. The problem with the self-publishing model is that without an agent and major publisher, the book may never gain a large following. And yet, in the midst of all this, one of the best selling books of all time was first released as a serial in the tabloid press, given to its first readers virtually free. Uncle Tom's Cabin was written by a cousin, Harriet Beecher Stowe. The following her book gained one chapter at a time in the tabloid press was sufficient to gain a following that led to book sales of over three hundred thousand copies in its first three months. So what I propose is a partnership. Over the next 365 days, I'll publish the proposed book in this blog, chapter by chapter, for free. You'll know when a new chapter is released. It will be given a number, 1, 2, 3 and beyond. Your job in the partnership will be to read, offer feedback, encouragement and promotion. Feedback and encouragement can be offered through the comments section below each blog post. Promotion will require your sharing what you read here with others. The photo shows collaborative engineering using Froebel playground blocks at the Clear Spring School. The students worked together (without adult intervention) to build a slide. You can see that each child was engaged physically, intellectually and emotionally. The educational policy makers argue back and forth on both sides of the issue, and in the meantime, the assessment of growth in children has been removed from teachers and parents and put into the hands of a child data industry that relies on periodically administered standardized tests, and costs an amazing amount of money. The worse part, however, is that parents and teachers are no longer trusted parts of the assessment process. And children are treated as data and not as human beings. We took our golden doodle Rosie to Camp Bow Wow, a doggie day care. Rosie loved it. She ran around and around with other dogs. Through an app we were able to watch her activities on our iPhones. There were no planned learning exercises. The staff observed and removed dogs that got grumpy, and they, using pooper scoopers, cleaned up the mess left by about twenty dogs having great fun. Some pre-schools for kids are like that. The staff in doggy day care were high school and college students given just a bit of training. And then there are pre-schools in which well-trained teachers plan lessons, and provide opportunities carefully timed for the children's growth. And so not all pre-schools are the same. At one time, trained teachers were also trained in the cues of child development. These days, we seem to prefer that growth be measured at a distance, by the testing industry. How very stupid we've become. Learning is one of the basic functions of a human being. This applies to children just as surely as it does to someone now reading this blog. 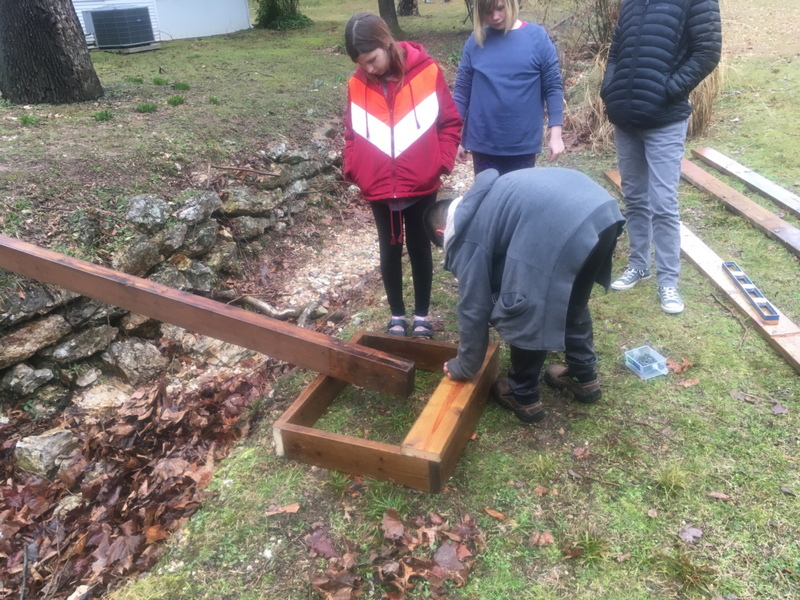 Yesterday at the Clear Spring School, my upper elementary school students worked on the bridge joining the athletic field to the new hands-on learning center. 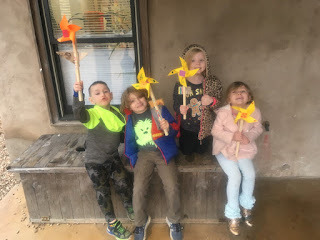 My Kindergarten students made pinwheels. As is always the case, they chose to color them with markers and add additional pieces of wood to create a custom effect. I've been having my first through 4th grade students working on projects from "Paper Sloyd" as a way of getting them to understand measuring, marking, and drawing straight lines. Paper Sloyd was introduced as a precursor to school woodworking, and was used in the primary grades. The materials are cheap. The objects are interesting. 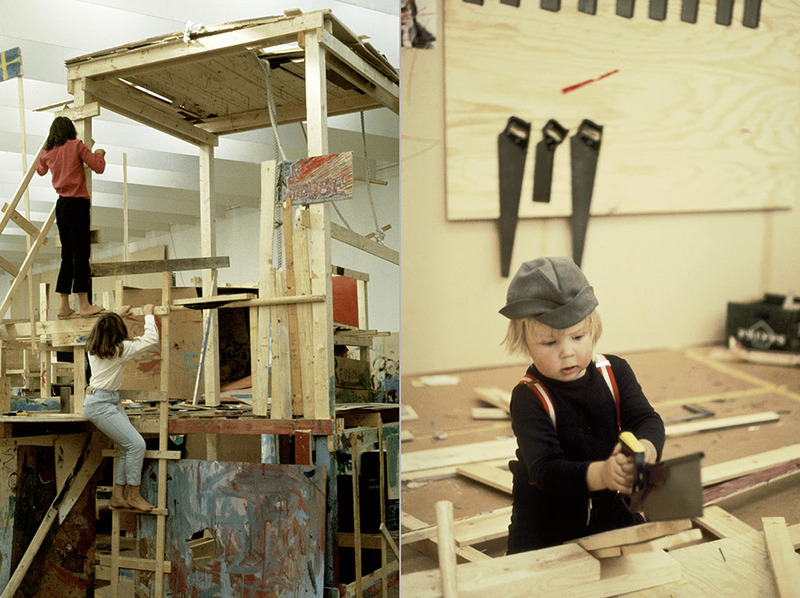 And the projects are laid out to build from the simple to the complex, and from the easy to the more difficult. Folding card stock is easiest if you take a sharp point and drag it along the folding line, not to tear the paper but to make an impression to crisp the folding point. This can be done with the back edge of scissors or with a nail, an awl or a small screw driver. Without first marking the fold in this manner, getting heavier paper like card stock to make crisp folds along marked lines is almost impossible. The kids are of course interested in decorating their work, and proudly carry home evidence of their learning. Make, fix and create. Encourage others to learn likewise. David Gribble, a UK educator, once observed that "the kind of education that honors kids’ interests & helps them to think deeply about questions that matter is of course appropriate for affluent children. For disadvantaged children, on the other hand, it is. . . essential." ALL children, in order to mature as thoughtful adults, must have opportunities to be of real service to family and community. This applies as much to the affluent (who often escape such opportunities and responsibilities) as to those children we categorize as disadvantaged. "Disadvantaged" children often take on responsibilities while the "advantaged" child may be sequestered and indulged. "To think deeply" as suggested by Gribble requires that the things kids think about actually matter... that they are real, and drawn from engagement in real life. So the simple way to get kids to think deeply is to offer them the opportunity to do real things. 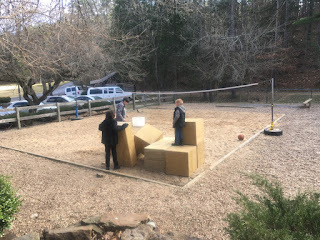 Over the weekend local members of the Northwest Arkansas Master Naturalists began installing birdhouses our students made at the Lake Leatherwood City Park. We can hope for more bluebirds to be nesting successfully in the area. Today I went to Wayne Capp's sawmill to pick up some white oak boards they had milled for me at my request. In addition to lovely wood (which I paid pittance for) Wayne gave me old steel band saw blades to use in making Damascus steel in the metals shop at ESSA, and a piece of curly figured cedar that he thought was pretty and that I might use for a box. While I was in St. Louis with their woodworking guild, I learned about their toy making program in which they have made and distributed over 62,000 toys to kids, thus far. 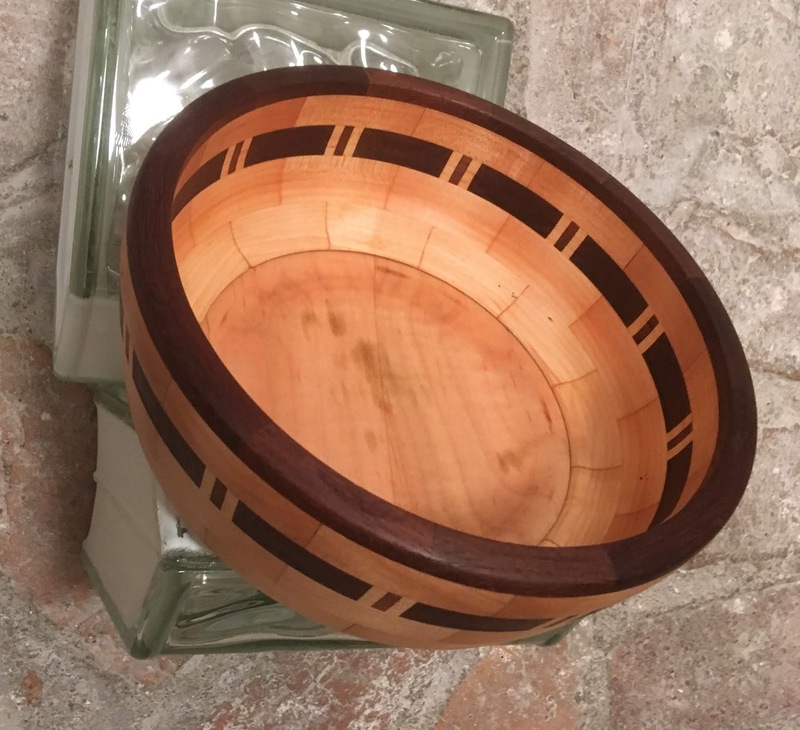 Then also while I was in St. Louis, the chairman of our annual auction committee sent me the photo of the segmented turned bowl, that came unsolicited from Tom Casey in Massachusetts. He had learned of our auction to support the school through facebook. 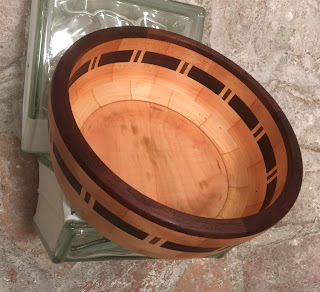 I attempt to describe how woodworking affects both intelligence and character. It makes us wiser than merely smart. It connects us in loving ways with each other and with the natural environment. If you don't know this already, get to know a woodworker in your community. He or she just might guide you toward a more fulfilling and meaningful life. I had a great time in St. Louis with the St. Louis Woodworker's Guild. The weather seems to be a thing they've gotten used to as snow on the streets did nothing to deter attendance for the class. Unfortunately, I was too busy to take any photos. We had a nice discussion of design. I made sleds and two kinds of box. With around thirty in the class, it was difficult for folks to to get a close-up view. We really do learn best when the work is in our own hands. Fortunately, most of those attending had prior experience in woodworking to serve as scaffolding for an understanding of my techniques. I admit to getting carried away with telling about Educational Sloyd and Kindergarten. But woodworkers are hands-on learners, and we must unite against the stupidity of those who think that academic style learning is something more than cheap. Yes, you can crowd tons of folks in a college lecture hall, while you pay a professor to stand up front delivering dry stuff while the students not-so-surreptiously check their facebook accounts to see who likes what. Colleges and universities can make big money thus. Hands-on learning, on the other hand, offers more valuable and more cost-effective, world-changing results. This weekend members of the Northwest Arkansas Master Naturalists began installing the bluebird houses my students made at our Lake Leatherwood City Park. A blog reader from Mälmo, Sweden sent this photo of kids using and making their own adventure playgrounds. Kids have a natural inclination to build their own character and intelligence through constructive arts. This applies as much to the future tradesman as to the future doctor, lawyer or mother. Give kids materials and tools, observe to assure their safety and get out of the way of their growth. Today I conclude a two day demonstration class with the St. Louis Woodworker's Guild. I made a presentation last night to a few members of the St. Louis Woodworker's Guild. A brave group, having weathered a snow storm that arrived in the early afternoon. The weather, was fit for neither man nor beast, but they showed up anyway, as did I. They were appreciative of my three points. The diverse woods that come from our forests are a precious resource and we have a responsibility to share an understanding of their beauty and value. The hands are the most important allies of the brain in the development of character and intelligence. And that we share a responsibility to promote hands on learning as the basic building block for the future success of humanity. Today I meet with a group of 25 woodworkers to demonstrate the making of boxes. Make, fix, and create. Assist others in learning lifewise. The guild offers a free evening presentation at Moolah Shrine, 12545 Fee Fee Road, St. Louis, MO 63146 beginning at 7 PM. I'll be showing slides of my work. We mounted the Clear Spring School's Little Free Library on a post yesterday adjacent the school's parking lot. With the addition of knobs and a latch, it will be ready for books very soon. The focus will be on children's books, and we left the lower shelf large enough to handle large picture books for beginning readers. 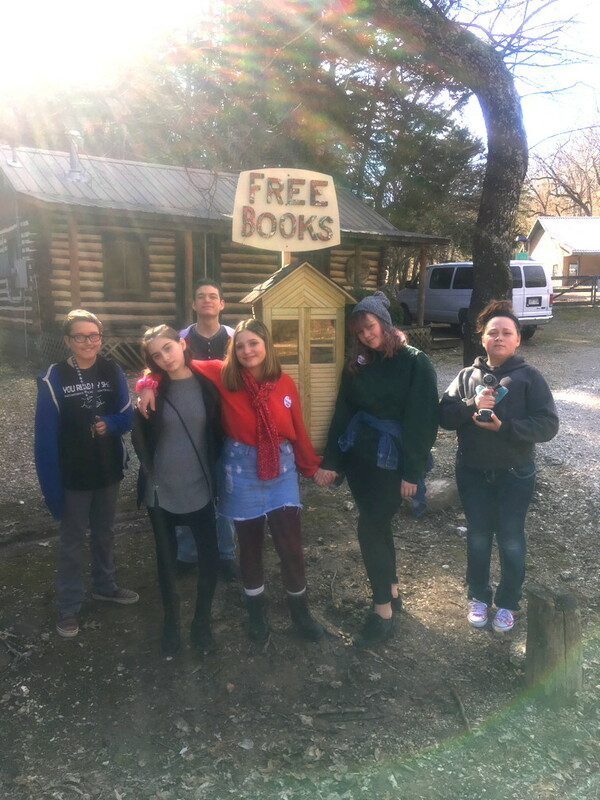 It will be a way through which we can share our love of reading with children from the larger community of Eureka Springs. Today I'm gathering supplies and packing for my trip to St. Louis where I'll teach a two day demonstration class in box making. Make, fix and create... Plan for others to learn lifewise. Yesterday in wood shop my first through 4th grade students made pinwheels, an exercise from the old book "Paper Sloyd". My point in having them make pinwheels was to get them more accustomed to using rulers to mark straight lines. Without straight lines, woodworking with hand tools is far less successful. In my middle school class, we installed the post on which to mount the Little Free Library, finished painting the sign for it, and delivered 22 birdhouses to the Northwest Arkansas Master Naturalists. 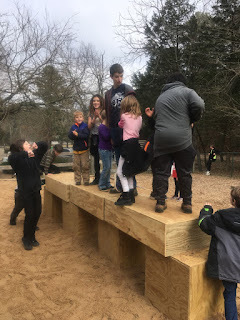 My upper elementary school students began building a foot bridge. Today in my own shop, I begin preparing for a weekend class in St. Louis. Here in Arkansas, the Walton Family Foundation set up a 10 million dollar program at the University of Arkansas. https://news.uark.edu/articles/42401/new-u-of-a-program-focusing-on-educational-equity-completes-first-teacher-training The administrator was paid $200,000 his first year. The idea of the program was, like the New York Teaching Fellows, to bring new recruits into the teaching profession, and train them on the job while they earn their master's degrees. The program managed a first year recruitment of twelve students, three of whom dropped out. In other words, the director was paid $22,222.22 for each new recruit. The director's salary was only a fraction of the expense. Go figure. They hope to do better in the coming years. Make, fix and create... Insist that others have a chance to learn likewise. Please honor and respect the teaching profession. Puppies and kids must play. 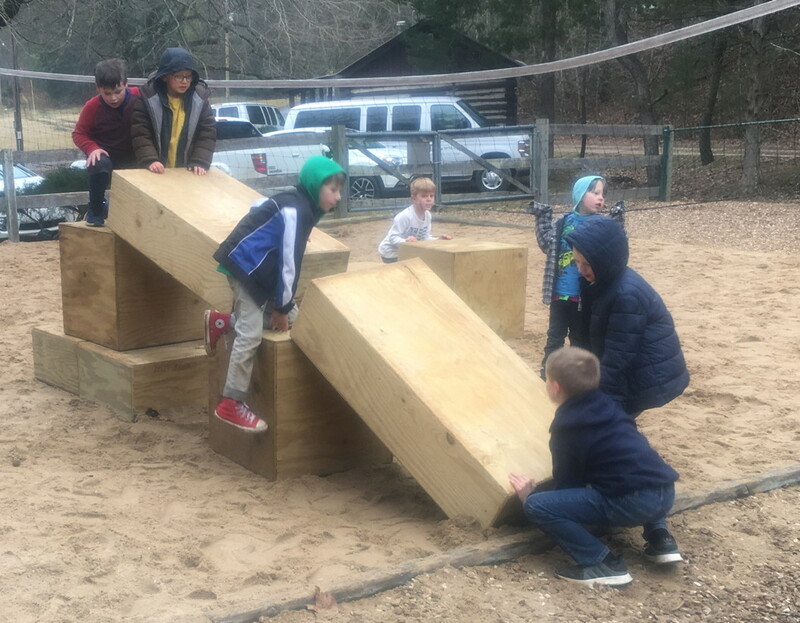 An Arkansas Republican legislator has proposed new legislation that would require every elementary school student in the state to be allowed 40 minutes of recess each day, including out of doors unstructured play when the weather is OK. It is odd to me that legislation would be required for this, as teachers and administrators if they had been trained in child development would have already put such policies in place and would have rebelled against state standards, policies and practices that prescribed otherwise. In any case, the research tells us that the legislator is right. I applaud his efforts and have my fingers crossed. In Finland, they have more recess time and out of doors recreation time than any other country in the European union and it works for them. When I visited a school in Helsinki, the kids (and teachers) all had their slippers on for indoor school, while those out of doors were wearing shoes. What a very fine thing. Lovely in fact. Children having adequate opportunity to play offers important benefits to the school environment. Students come in from rigorous play prepared for more rigorous academic engagement. Teachers, too, need the emotional and mental release that happens when kids are successfully engaged in out of doors play. The photo, once again shows large Froebel blocks used in out of doors play. In this case, the blocks have been arranged by the kids to serve as an obstacle course with students jumping or climbing, one to another. Perhaps these should also be used in other schools. Yesterday I had a design class in collaboration with the Eureka Springs Community Center and the Eureka Springs School of the Arts. Next weekend I'll be in St. Louis for a class with the St. Louis Woodworker's Guild. Make, fix and create. Make space for kids to engage in the real world to enhance their academic learning. 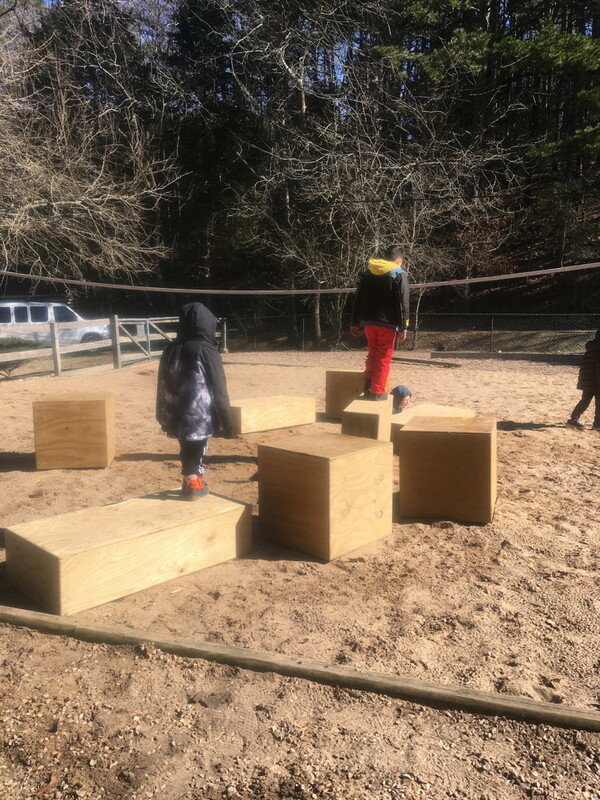 The students at Clear Spring School have found a new use for the large outdoor Froebel blocks. They've set up an obstacle course to climb from one to another. Some are set up at precarious angles to involve climbing. The students adjust the blocks so they can jump or climb from one to another, and pack sand under the corners as needed to make them stable. Today I have a class on 3-D design at the Eureka Springs Community Center in cooperation with the Eureka Springs School of the Arts. The hours are 1-4 PM. There is room inn the class for late registrants. Show up and we will accommodate. 3-D design will be useful whatever you want to make. Yesterday a friend passed along an old classic Delta bandsaw to the Clear Spring School for restoration and use in our wood shop. It had belonged to his dad. Make, fix, create, and plan for others to learn lifewise. My student decided to build a boat. He used hot melt glue to affix the sides, but then for the ends, asked if I had screws and a screw gun. He thought they were called for as the awkward angle of the sides would make nailing difficult. It is wonderful to observe first and second grade boys with such a grasp of the technicalities involved in making things from wood. I helped him with the first screw or two, showing how drilling a pilot hole first would help to get the screws started. From then on the work was his own. 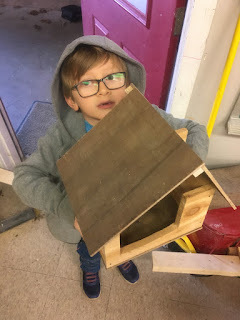 That he asked for screws and a screw gun suggest that he comes from a home in which his parents are involved in doing real things and letting him take part. The lightweight cordless drill made by Tacklife is an excellent tool for kids in similar circumstances, as it is considerably smaller than most cordless drills. Today my 5th and 6th grade students will build a model bridge in preparation for building a real foot bridge at school, crossing a creek. It is too cold out for them to begin work on the real thing. 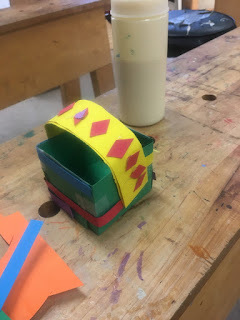 Tomorrow February 9, 2019, I have a 3-D design class with ESSA. The lessons apply beyond box making and there are still openings in the class. Call 479-253-5384 to enroll. Make, fix and create... Assist others in learning likewise. The large Froebel blocks we've made at Clear Spring School are hollow and made from 1/2 in. treated plywood with an interior frame of 1 in. square strips cut from 5/4 treated deck boards. We use Titebond 3 water-proof glue and 1 1/4 in. narrow crown staples to hold the corners together. The secret to building them is to build a frame around the perimeter of certain parts, that then allow for other parts to be added. So along each inside edge is a 1 in. square block. The 1 in. square dimension for interior blocking was selected to keep weight and material expense low, using commonly available material, while offering sufficient gluing and stapling surface area to form strong joints. The students have told me that they need more 4' x 2' x 1' blocks to be able to build what they "have in mind." Perhaps we will add to the collection over time. Unlike apple boxes, ours are made to Frobel's proportions, and of weather proof materials for out of doors use. The interesting object shown in the photo is made using a flip car body as the base for construction with small band sawn dogs added. I cannot explain what it all means, or why certain parts were added, but each addition was carefully conceived. The student was very proud of his work. I helped by using the band saw to cut shapes the student had drawn and by close examination you can see the pencil drawings on each part. Make, fix and create. Adjust schooling so that others learn likewise. Yesterday my 1st through 4th grade students made small pivot lid boxes. Some left them plain. Some decorated them with markers and others turned them into creatures of various kinds. The one shown in the photo is a Labrador retriever, complete with large floppy ears, tail and feet. It will likely become a part of a family collection and be cherished for years. At least, it deserves that. 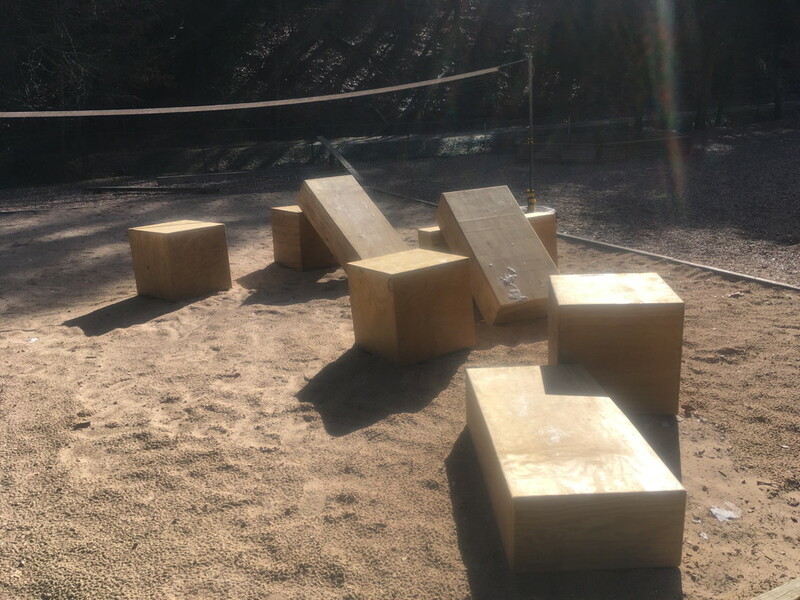 Yesterday I also arranged our set of large Froebel blocks into a cube. The kids asked what I was doing. "Playing," I said. Within minutes, their own play had rearranged the blocks into new configurations. 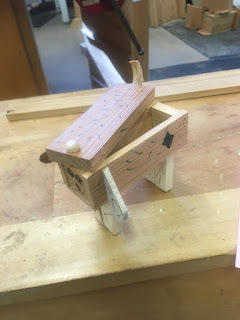 The photo shows a student's cat house he designed in wood shop. It took some figuring out. First he learned that it is very difficult to direct nails into the edge of very thin wood. So thicker wood was needed for the sides. Then various modifications were necessary thus requiring an examination of the uses of various saws. 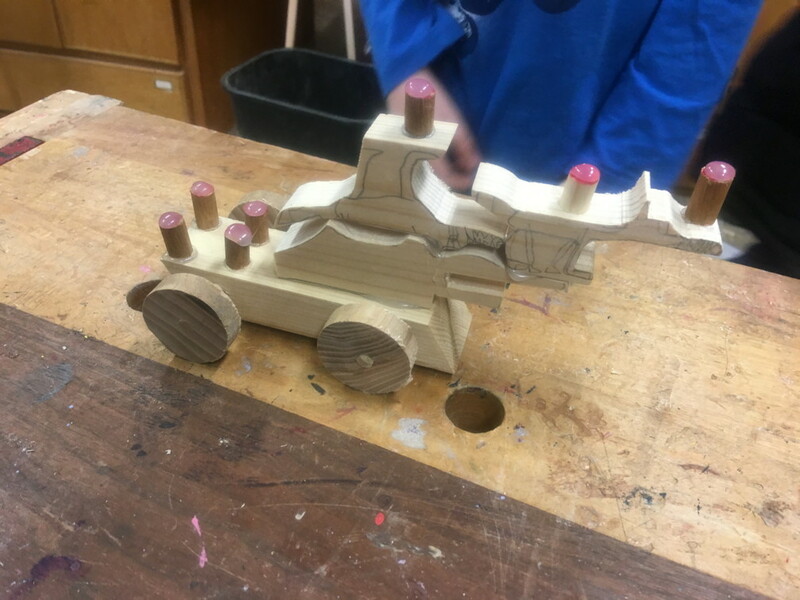 This was but one of several different projects happening all at the same time in wood shop on Wednesday. The kids like it very best when they are allowed to experiment and come up with projects of their own design. I had been challenged on twitter by someone who had misunderstood my point in response to a post from another party, concerning school emphasis on children being "ready to learn." I was asked on twitter, "Why limit kids to what interests them? Seems like a low bar." Days later I found the time to respond. I did not suggest that we limit kids to what interests them. Diesterweg came up with the following that then became Salomon's theory of Educational Sloyd. Start with the interests of the child. Move from the easy to the more difficult, from the known to the unknown, from the simple to the complex and from the concrete to the abstract. Jerome Bruner called this "scaffolding." But it all starts with the interests of the child. 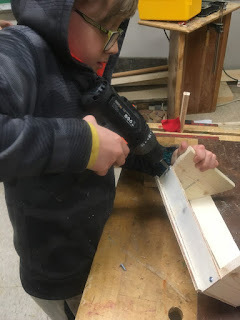 The reason my students love days in which they are allowed to experiment and come up with projects on their own is that their individual interests are met, and their own intrinsic motivations. Isn't that when we learn best? Adults and students alike? Make, fix and create. Offer others the opportunity to learn likewise.